The equinox spring tides are the lowest tides of the year, and the lowest tide at Kimmeridge Bay in 2010 fell on the 2nd March. This is when the ledges at Kimmeridge Bay can be seen at their very best, as they stretch out from the cliff face like an octopus’s tentacles, in fact most of the ledges have been submerged for as much as 6 months. I’ve waited for this moment in order to get a certain picture that I have pre-visualized, sadly it wasn’t to be becasue whilst the sea and wind behaved themselves the sky didn’t and a blanket of heavy cloud was draped overhead, so what I had in mind didn’t materialise, but it would be boring if you got the shot you wanted first time round……wouldn’t it? ~ by David Baker on 3 March, 2010. This is one of my favourite shots in your blog so far, just love that ridge leading you out to sea and the cool blue tones, first class ! 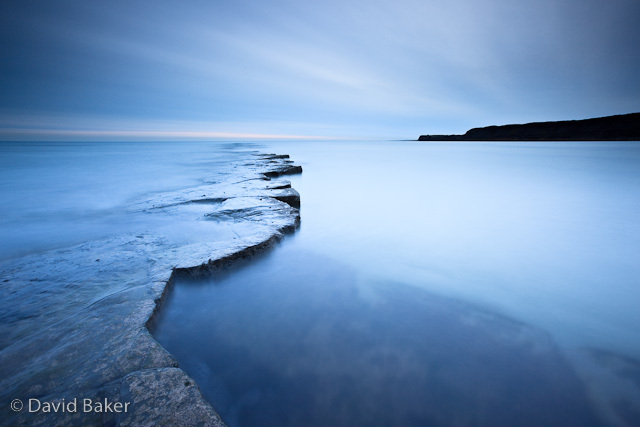 Thanks Stuart, its certainly one of my favourites from Kimmeridge. I three others taken the same evening all with slightly different ledges that I might post on the blog as a group.